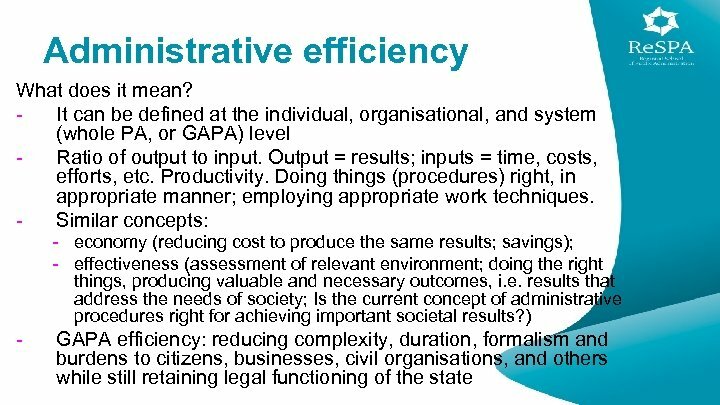 Administrative efficiency How can it be measured? 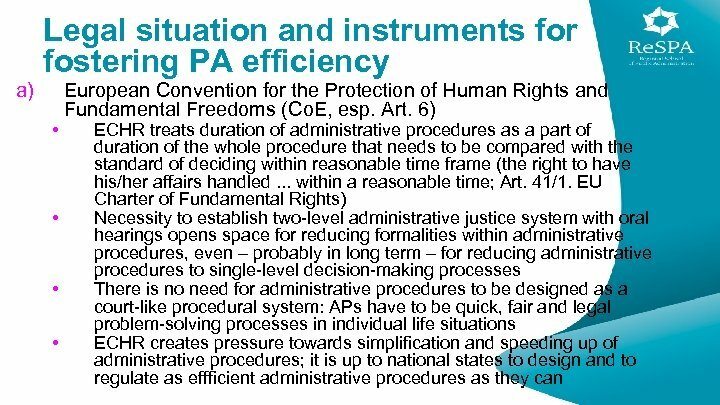 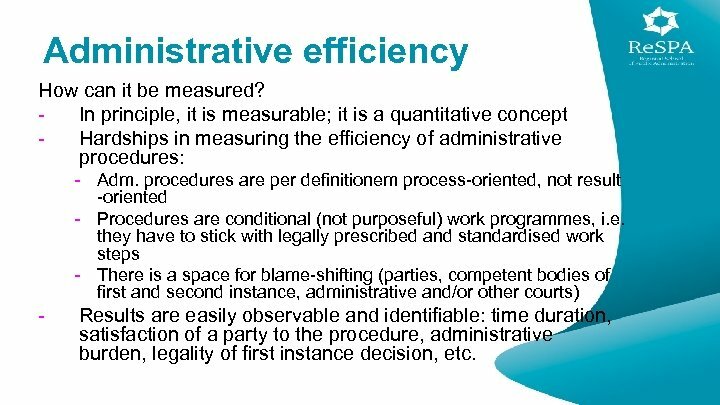 In principle, it is measurable; it is a quantitative concept Hardships in measuring the efficiency of administrative procedures: - Adm. procedures are per definitionem process-oriented, not result -oriented - Procedures are conditional (not purposeful) work programmes, i. e. they have to stick with legally prescribed and standardised work steps - There is a space for blame-shifting (parties, competent bodies of first and second instance, administrative and/or other courts) - Results are easily observable and identifiable: time duration, satisfaction of a party to the procedure, administrative burden, legality of first instance decision, etc. 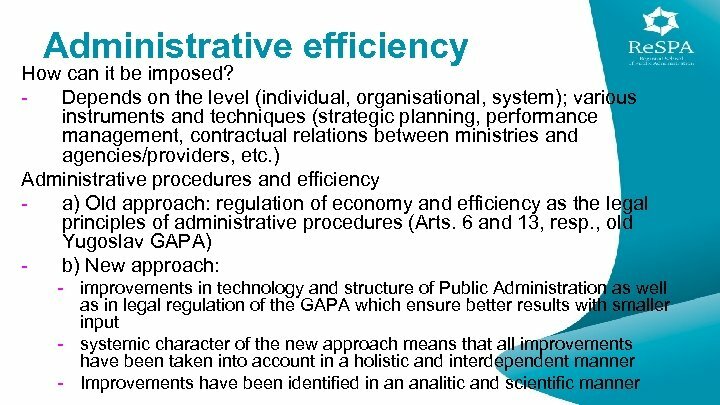 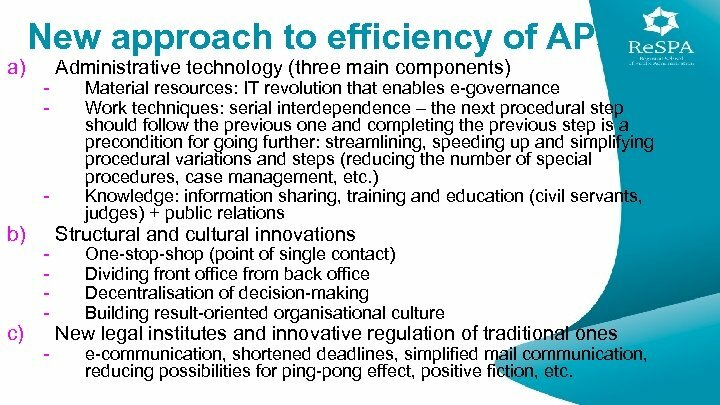 a) New approach to efficiency of APs - - b) c) - Administrative technology (three main components) Material resources: IT revolution that enables e-governance Work techniques: serial interdependence – the next procedural step should follow the previous one and completing the previous step is a precondition for going further: streamlining, speeding up and simplifying procedural variations and steps (reducing the number of special procedures, case management, etc. ) 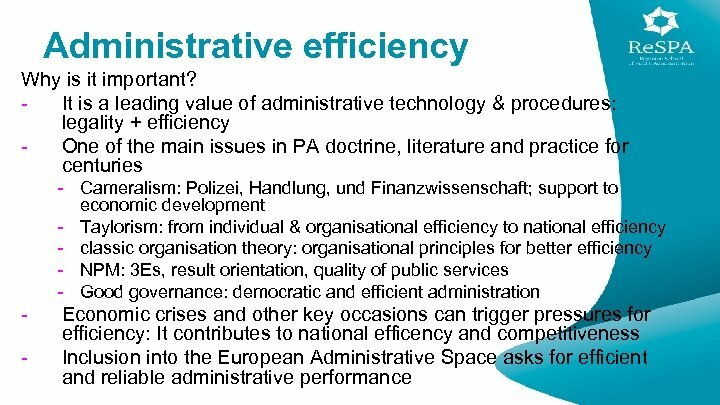 Knowledge: information sharing, training and education (civil servants, judges) + public relations Structural and cultural innovations One-stop-shop (point of single contact) Dividing front office from back office Decentralisation of decision-making Building result-oriented organisational culture New legal institutes and innovative regulation of traditional ones e-communication, shortened deadlines, simplified mail communication, reducing possibilities for ping-pong effect, positive fiction, etc. 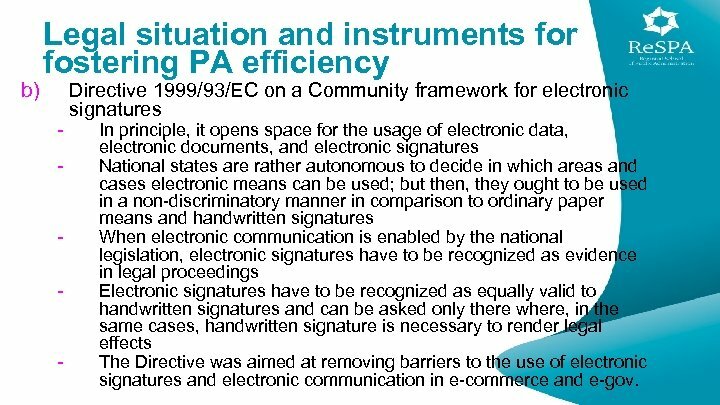 b) Legal situation and instruments for fostering PA efficiency - - - Directive 1999/93/EC on a Community framework for electronic signatures In principle, it opens space for the usage of electronic data, electronic documents, and electronic signatures National states are rather autonomous to decide in which areas and cases electronic means can be used; but then, they ought to be used in a non-discriminatory manner in comparison to ordinary paper means and handwritten signatures When electronic communication is enabled by the national legislation, electronic signatures have to be recognized as evidence in legal proceedings Electronic signatures have to be recognized as equally valid to handwritten signatures and can be asked only there where, in the same cases, handwritten signature is necessary to render legal effects The Directive was aimed at removing barriers to the use of electronic signatures and electronic communication in e-commerce and e-gov. 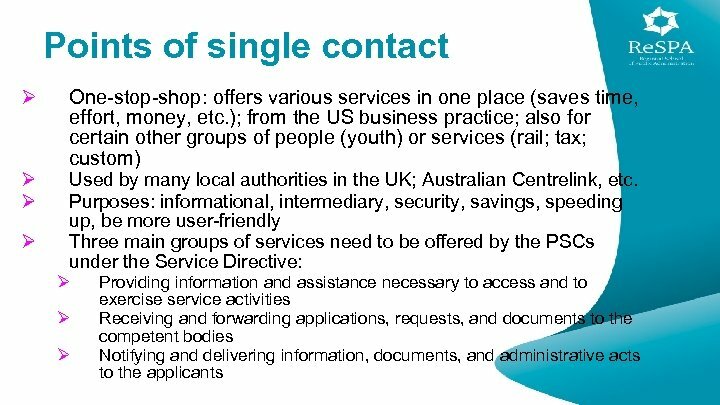 Points of single contact Ø Hungary is an interesting example (inspired by the Singapore Citizens Center, as one of the earliest examples? 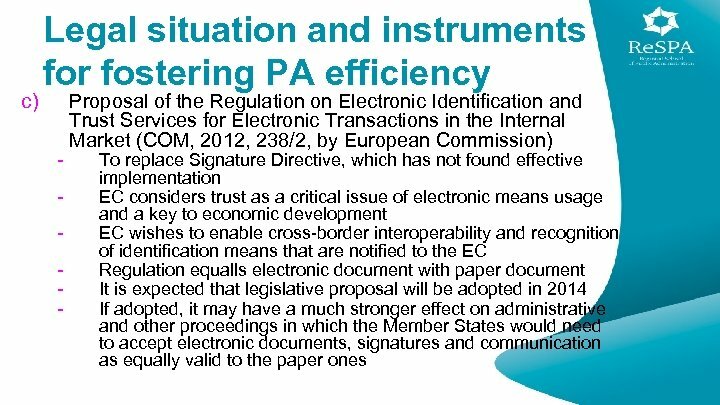 ): Ø Ø Ø Ø During recent reforms separation of front office and back office functions has been implemented. 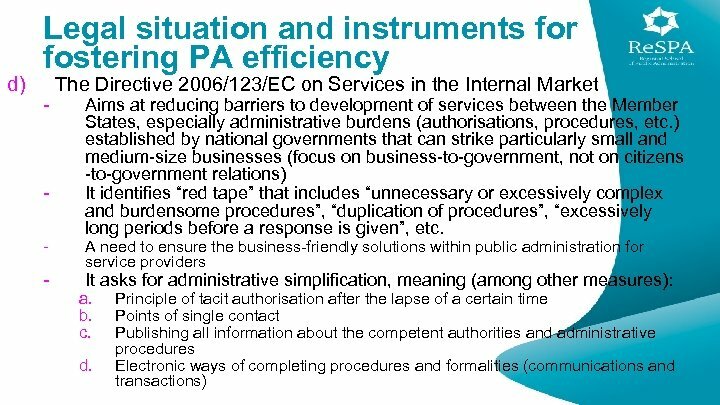 Back office functions have undergone electronic restructuring. 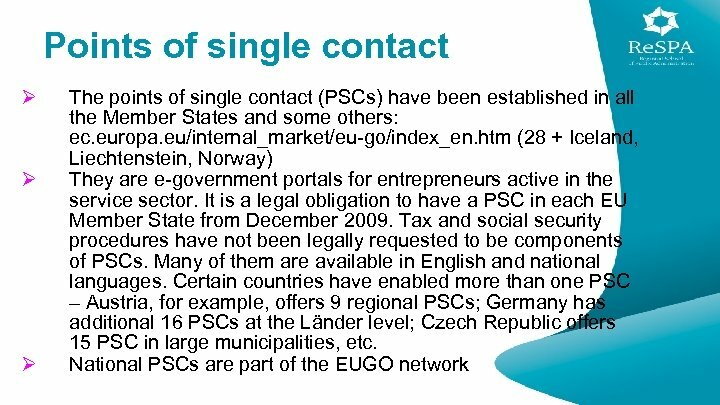 The whole system of physical PSCs started to function from January 2011 – Government Windows (300 in Autumn 2013). 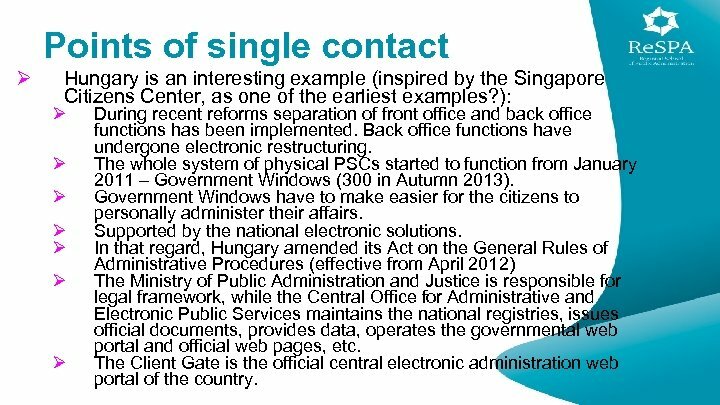 Government Windows have to make easier for the citizens to personally administer their affairs. 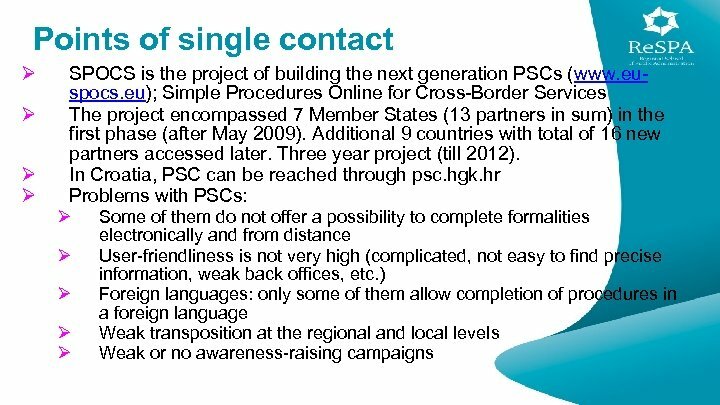 Supported by the national electronic solutions. 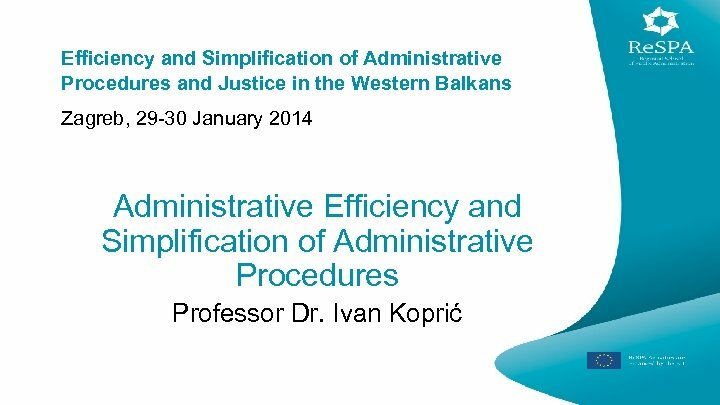 In that regard, Hungary amended its Act on the General Rules of Administrative Procedures (effective from April 2012) The Ministry of Public Administration and Justice is responsible for legal framework, while the Central Office for Administrative and Electronic Public Services maintains the national registries, issues official documents, provides data, operates the governmental web portal and official web pages, etc. 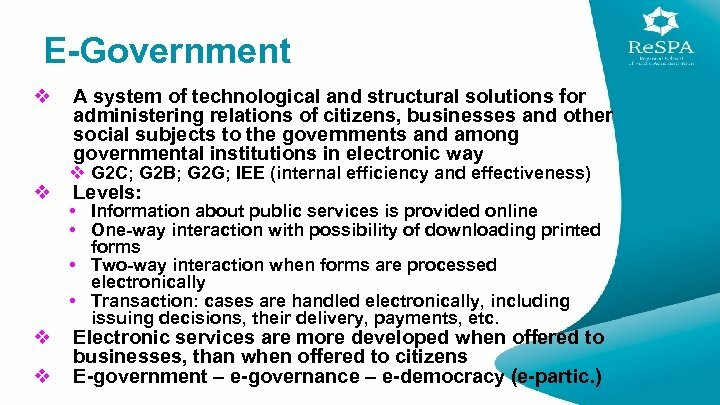 The Client Gate is the official central electronic administration web portal of the country. 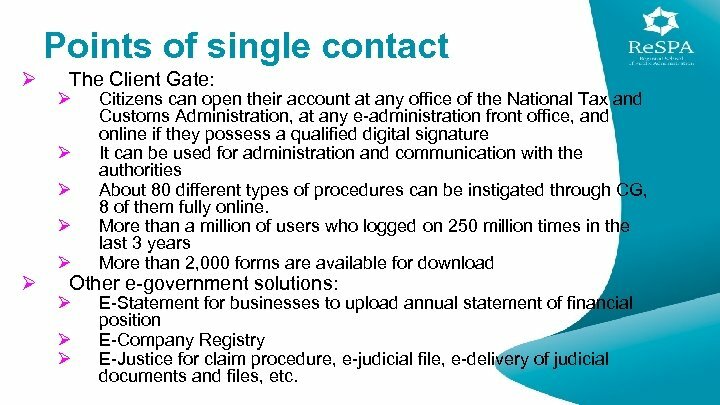 Points of single contact Ø The Client Gate: Ø Ø Ø Citizens can open their account at any office of the National Tax and Customs Administration, at any e-administration front office, and online if they possess a qualified digital signature It can be used for administration and communication with the authorities About 80 different types of procedures can be instigated through CG, 8 of them fully online. 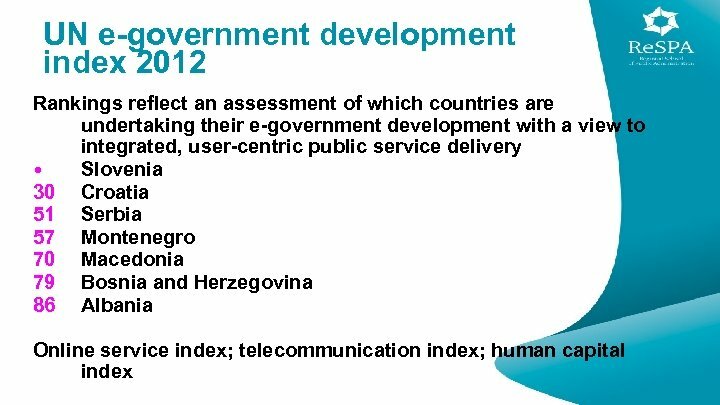 More than a million of users who logged on 250 million times in the last 3 years More than 2, 000 forms are available for download Other e-government solutions: Ø Ø Ø E-Statement for businesses to upload annual statement of financial position E-Company Registry E-Justice for claim procedure, e-judicial file, e-delivery of judicial documents and files, etc.